Villeroy and Boch have been manufacturing ceramics since 1748 when François Boch set up a pottery company with his sons in the Lorraine village of Audun le Tiche. They have years of experience in the manufacturing of homeware products and truly understand the necessity of a sleek, stylish and beautiful interior that suits individual needs. Villeroy and Boch are champions of individuality, and when it comes to aesthetics their goal is to provide efficient, timeless and well-designed products that will fit seamlessly into the story of your home. We understand that choosing the right product for your home can be a daunting experience. There are so many different styles to choose from and we understand the importance of finding the right fit for you and the people you share your home with. We have prepared a guide to our range of Villeroy and Boch shower fittings to help you make a decision and to help you to create your dream bathroom. What are the different Villeroy & Boch Collections? Villeroy and Boch's ranges are designed to work together to ensure aesthetic continuity and reliability in your home. The Subway 2.0 range is ideal for those who prefer a contemporary minimal aesthetic, and the Subway (Soho) range is clean and modern with a selection of bold pieces in simple shapes for those who want to make a statement. The Cult range combines technical precision with classic 1920s design in order to provide the vintage-lover with pieces that look great and also offer maximum safety, ease, comfort and longevity. The Subway 2.0 range is sleek, compact and practical. It is designed with a minimalist aesthetic in mind and maximises the use of space. 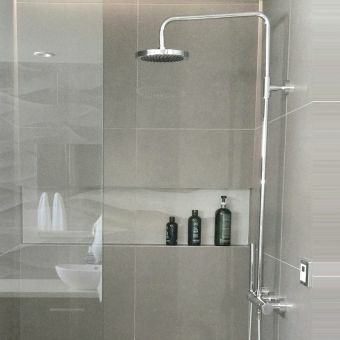 Subway products are designed to work together in order to provide you with a bathroom that will last a long time, is easy to use and coheres to your individual aesthetic framework. 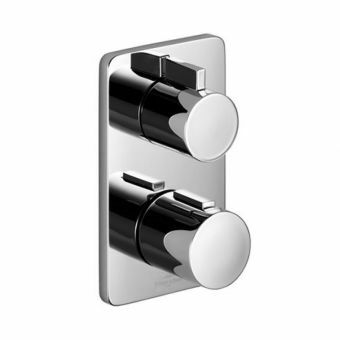 The Villeroy and Boch Subway Concealed Shower Mixer Valve controls water flow and temperature with a single lever. It can be supplied with or without a diverter valve to control either single or dual outlets, according to your preference. Each mounting plate measures only 150mm in diameter, and the handle is designed to be easy to use and pleasing to touch. This minimal aesthetic is perfect for the home or hotels, apartments and holiday rentals. It is an undeniably contemporary design which is perfect for any modern home. 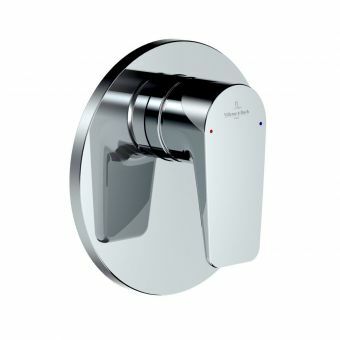 The Villeroy and Boch Subway Shower Elbow and Bracket is designed to complement other products in the Subway 2.0 range. The bracket comes with a 55mm diameter mounting rosette, and when affixed to the wall is designed to hold an external shower unit in place. The wall elbow reduces backflow in order to provide maximum reliability and to give your products a much longer lifespan. These pieces utilise shower space in the most efficient way, and Villeroy and Boch's clean and strong minimalist craftsmanship mean that they will add the finishing touch to your bathroom, especially when combined with other products from the Subway 2.0 range. The Subway (SoHo) range is another variation on the contemporary bathroom with a focus on technical and practical requirements. The pieces come in a variety of bold shapes and finishes, in order to provide you with the perfect brassware for your home. The Subway (SoHo) range is designed to be used in conjunction with other Subway (SoHo) products, but you could also mix the Subway (SoHo) range with the Subway 2.0 range for a personal twist and a fresh and exciting modern aesthetic. Our Villeroy and Boch Subway Thermostatic Shower Valve is fitted with dual control valves for the use of separate shower outlets. It has an integrated diverter valve so that you can switch easily between shower units and is built with longevity and ease of operation in mind. Measuring 150mm in diameter, this unit will provide your bathroom with minimalism without compromising on practicality. It also has a 38-degree safety lock which can be preset to your preference, to ensure a safe and relaxing shower experience for you and your loved ones. The Subway (SoHo) thermostatic shower valve is finished in chrome to ensure that your bathroom is always sleek and sparkling. Villeroy and Boch's Cult range is a contemporary take on the classic 1920s aesthetic, with vintage-style brassware combined with modern requirements in order to provide you with a bathroom that pairs safety and comfort with timeless design. Cult products should be used together as a range in order to provide your home with a bathroom that is consistently stunning throughout. 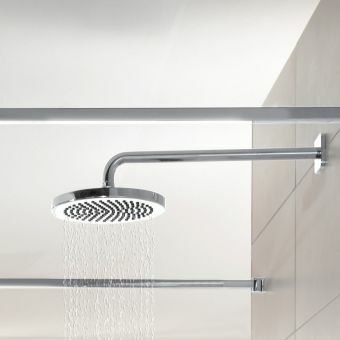 The Cult 220mm Shower Head can be affixed to the wall via a mounting arm or attached directly to the ceiling. Our shower heads operate a flow of 12 litres per minute and come with half inch connectors for easy plumbing installation. The round shower heads can be finished in chrome or matt white depending on your taste, and add a touch of classic sophistication to the vintage-inspired home. 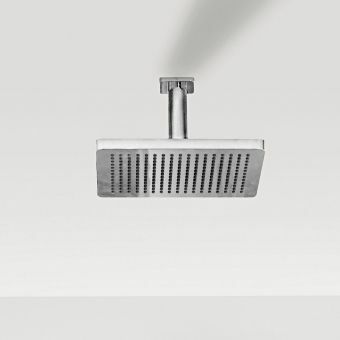 The Cult 240mm Shower Head offers an alternate take on the 1920s classic. It measures 300mm by 240mm and can also be fixed to the wall through the use of a mounting arm or to the ceiling, depending on the size, shape and feel of your bathroom. The Cult 240mm Shower Head offers a bold and eye-catching design for those who want to make more of a statement. The angular shape offers a contemporary twist on a vintage classic, and the larger size means it has a flow rate of 14 litres per minute. Similarly, this shower head can be ordered in a chrome or matt white finish, in order to ensure the perfect fit for your home. The Cult Concealed Shower Mixer Valve is an ideal component to be used in conjunction with a shower head from the Cult range, for minimal contemporary design with a vintage feel. It can be purchased with or without a diverter, in order to operate single or dual shower outlets, depending on personal needs and preferences. The cover rosette measures 150mm by 90mm and the right-angled single lever design means that it is bold, simple and easy to use. Perfect for the home, hotel or holiday apartment, the Cult range is simple, stylish and practical with a range of connectors for hassle-free installation. The Cult Thermostatic Shower Valve is perfect for those who want to combine style and outstanding design with comfort and safety, in order to provide an enjoyable shower experience for all of the family. The thermostatic cartridge is preset at the recommended 38-degree lock but can be altered to taste. It stops all water flow in the event of a loss of cold water, in order to ensure that you never have to worry about scalding. 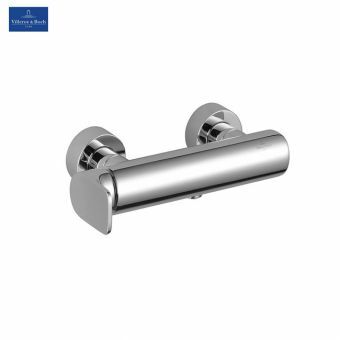 It measures 150mm by 90mm, and comes in chrome or matt white so that it will fit perfectly with your other products from the Villeroy and Boch Cult range. The Cult Thermostatic Shower Valve is ideal for those who don’t want to compromise on safety or style. 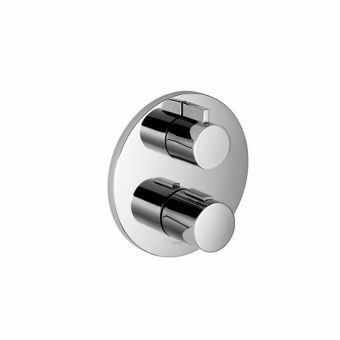 The Cult xStream Concealed Shower Mixer Valve controls shower temperature and water flow with one simple lever. It is fitted with backflow prevention and is designed for grip and minimal fuss. The Cult xStream mixer valve is supplied with connectors that are compatible with most plumbing arrangements for easy installation and maintenance. The unconventional shape provides your bathroom with a bold and contemporary statement piece, which complements other brassware items from the Cult range perfectly. The Cult Thermostatic Shower Kit is a stunning piece of both aesthetic and technical design. It is based on the exposed brassware style of the 1920s but is fitted with a thermostat to bring it up to date. It combines a 220mm rain shower head, a removable hand shower and an exposed thermostatic valve in order to ensure the best shower experience to suit your individual needs. Hot and cold water can be isolated and excessive temperatures can be banished by the thermostatic lock feature which can be set to personal preferences. The elegant design will add an unconventional touch to a vintage-style bathroom, and it is truly the jewel in the crown of our classic-inspired Cult range. Whether you prefer sleek minimalism, statement pieces or timeless classics, here at UK Bathrooms we have Villeroy and Boch bathroom fittings and brassware to suit your needs. We also offer a price promise on Villeroy and Boch products, to ensure that you pay the best price for your products every time.